Windows are an important element of a building, letting in light and air, breaking up expanses of wall and allowing those inside to view the outside world. Windows also are a source of heat gain in the summer and heat loss in the winter, accounting for up to 25 percent of heating and cooling bills. If you are building a new home, remodeling an older home or need residential glass repair in Houston, understanding the benefits of energy-efficient windows will help you decide which window replacements are best for your situation. High performance windows improve indoor comfort and reduce the load on heating, ventilation and air conditioning systems. They also reduce condensation, an important factor in humid environments like Houston. Heat flows through glass by convection, radiation and conduction. There are several terms that describe heat transfer. R-value measures the resistance of a material to heat. The higher the R-value, the more thermal benefit. A double pane window has an R-value of about 2.0. A single pane window has an R-value of about 0.9. U-value measures the transference or conduction of heat through a material. The lower the number, the better the insulating property. A double-pane window has a U-value of approximately 0.7. A single pane window has a U-value of about 1.22. The solar heat gain co-efficient (SHGC) measures the amount of solar radiation transmitted through a window or door and released as heat inside a building. The lower the SHGC, the less solar heat transmitted. A high SHGC allows solar radiation into the building for heat gain, better for colder climates. A low SHGC blocks solar radiation, better for warm climates to reduce air conditioning loads. Older homes were often built with single-pane glass that has low insulating properties, approximately R-0.9 or U-1.22. 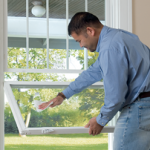 Newer homes and most window replacements use double- or triple-pane glass for better insulating values. The material of the window frame also affects the thermal efficiency of a window. Vinyl, wood, fiberglass and composites are better insulating materials than aluminum or other metals. Fiberglass frames have an air cavity that can be insulated, providing even better thermal value. There are a number of different types of energy-efficient window glass and glazing options. Double-glazed windows have two panes of glass separated by a dead air space that should measure between ½ inch and 5/8 inch. Too little space between panes is not effective, while too much space allows air movement that causes heat transfer. 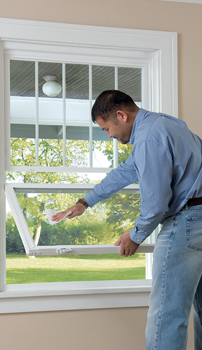 Triple-pane windows use three panes of glass separated by dead air space. Triple-pane windows provide better insulation than double-panes, saving up to 30 percent more energy, but also cost more. Multiple-pane windows can be filled with an inert gas, usually argon or krypton, between the panes for better heat resistance. A spacer bar placed between the panes separates the glass panels. Warm edge spacer bars are recommended over metal spacer bars to prevent the formation of condensation between the panes. Window replacement and glass repair in Houston should take into account the local climate to avoid moisture build-up between panes. Several types of coatings are also used to enhance heat resistance and lower solar heat gain. Standard glass absorbs 84 percent of the energy that strikes it. Low-E coatings absorb only 4 percent of the energy and reflect 96 percent. These coatings can be customized to reflect specific parts of the spectrum. Coatings in Houston should minimize solar gain to reduce heat transfer during the hot summer months. If you would like to reduce glare and increase comfort in your automobile as well as you home in Houston, auto glass can be customized with tinting and coating options. Using less air conditioning in your car also saves energy. This entry was posted in Energy Efficient Windows and tagged Glass Repair Houston, Houston Auto Glass, Residential Glass Repair Houston. Bookmark the permalink.